In this blog post we describe our initial testing of a colorimetric kit for measuring lead in drinking water. In 2015, a Virginia Tech research team found that over 40% of the homes in Flint, MI had elevated lead water levels with 25% of homes well above the EPA 15 ppb maximum contamination level. The levels of lead in drinking water should be zero or undetectable. The Flint water crisis was widely reported in the news and lead contamination of drinking water is still an ongoing public concern. The goal of this project was to find an affordable and easy-to-use lead test for measuring lead in the low ppb range that could be used with our $80 open source colorimeter kit. The Hach LeadTrak Fast Column Extraction Method is a colorimetric assay that can measure from 5 ppb up to 150 ppb. Cost is approx. $12 per test. Below we describe some of our initial results with this lead test. We may examine other tests in the future. The method for using the kit is described here: LeadTrak Fast Column Extraction Method. Most of the steps were followed exactly as described. There is a modification to the procedure after Step # 13. Label two 12 mL tubes - "A" and "B"
The first step was to prepare a 4-point calibration curve. The LeadTrak kit contains a 10 mg/L (10,000 ppb) standard. This was diluted with deionized water to make 100 mL of each calibration solution as shown in the Table below. Samples were processed as described in the Methods. According to the Hach documentation, absorbance is measured at 477 nm so we used the 470 nm blue LED in the colorimeter as follows. Once we started testing we found that the absorbance values for the samples measured with the colorimeter were pretty low, with the highest 150 ppm sample only having an absorbance value of 0.21. 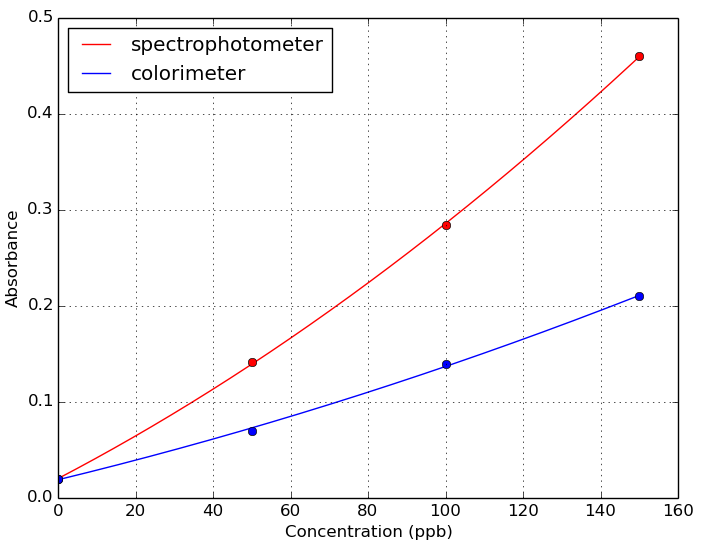 So we also measured the absorbance of the samples with a spectrophotometer at 477 nm for comparison. 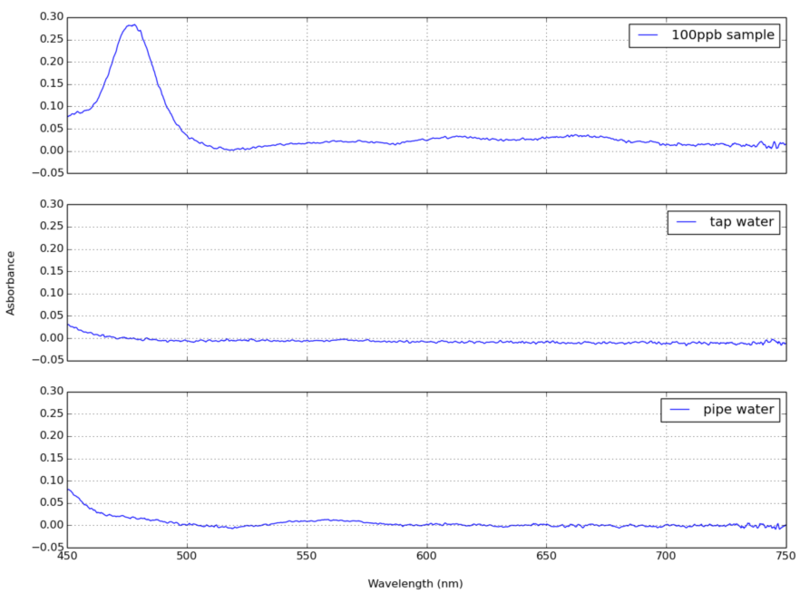 We modified the colorimeter to use the Ocean Optics USB2000 spectrophotometer to produce the absorbance spectra shown below for all 4 calibration solutions. You can see the peak absorbance at 477 nm which corresponds to the lead concentration. 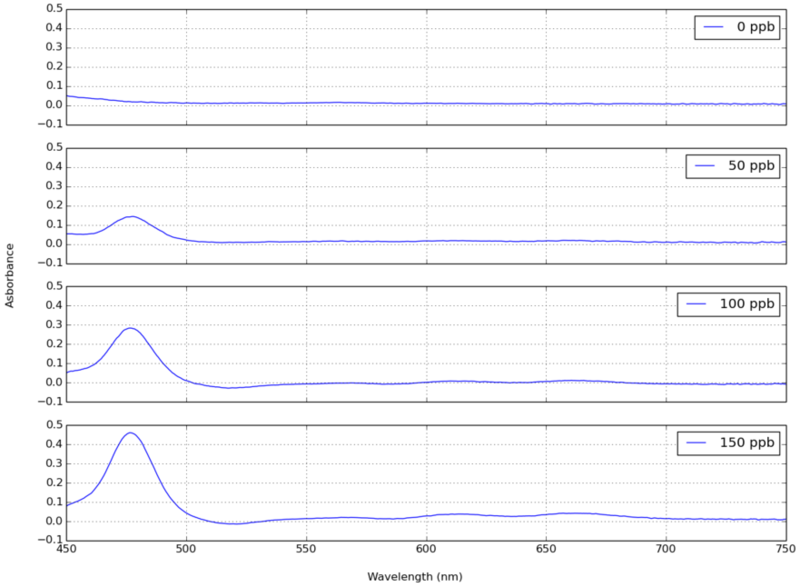 We used this data along with the colorimeter data to make the calibration curves shown below. Tap water - Water from a regularly used kitchen water tap. Water was run for about 5 mins before a sample was drawn. Collected 100 mL. Pipe sample - Water from a tap that had not been opened in at least 24 hours. Collected the first 100 mL. Should indicate any contamination of water from lead in pipes. Samples were processed along with a 100 ppb calibration for comparison. Unfortunately using the Colorimeter 470 nm LED isn't going to be sensitive enough to measure values in the lower ppb range that we are interested in, so we only used the Spectrophotometer. No lead was detectable in either water samples. Overall we found that the Hach LeadTrak method for measuring lead in drinking water was very easy to use and gave very repeatable results. During several preliminary tests not shown here, we found that we were getting very consistent results for the calibration standards with both the colorimeter and the spectrophotometer. Although abit pricey ($12 per test) it is a convenient lead test and only takes 15 - 20 mins once you are familiar with the method. For measuring low levels of lead in drinking water you should use a spectrophotometer and measure at 477 nm (+/- 2 nm). With this method we did not find any lead above 3 ppb in our water. For measuring higher ranges of lead you can use the colorimeter with the 470 nm blue LED. The unmodified colorimeter was not sensitive enough to detect lead in the range we are interested in (5-15 ppb range). The colorimeter can be modified by using a bandpass filter, so we will repeat the measurements with a 480 nm +/- 2 nm bandpass filter shortly. This will enable more sensitivity as we will be measuring closer to the absobance max. The filter costs an additional $35 but this would still be significantly lower than the cost of a spectrophotometer. In this blog post we give a quick overview of some of the main differences between two open source potentiostats: Rodeostat and Cheapstat.